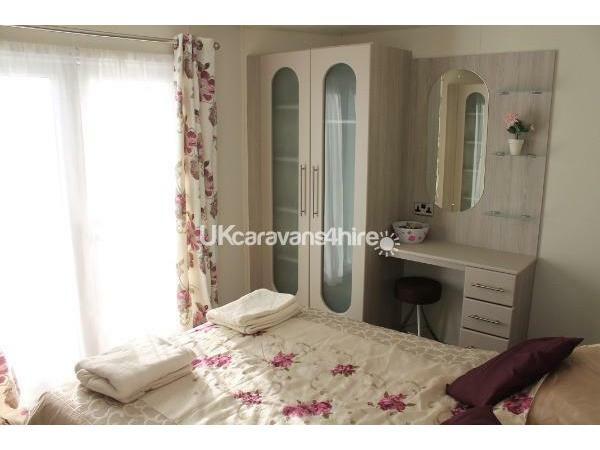 Additional Info: Central lounge and kitchen, with generously sized bedrooms at opposite ends of the caravan, each with its own bathroom. 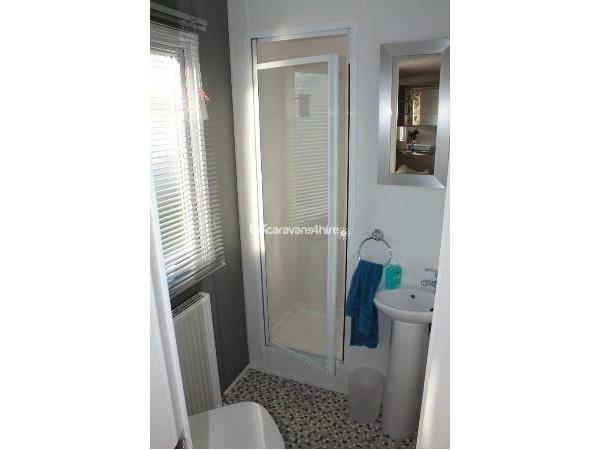 There is eye-level fridge with freezer underneath, and a washing machine/dryer. 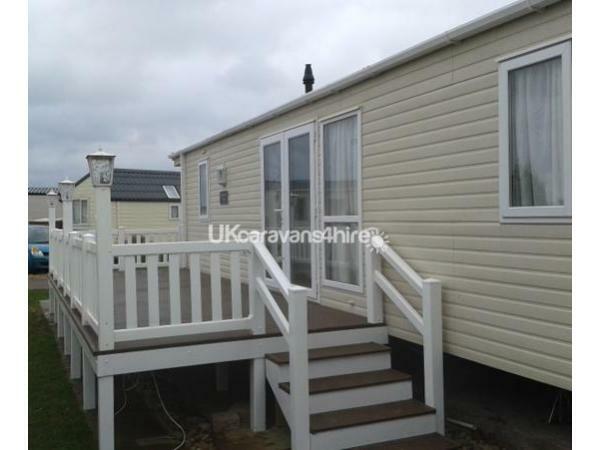 Because our caravan is new and we want it looked after properly we have to charge £50 damages deposit on top of the hire charge. It will be refunded within a week of your stay, if everything is o.k. 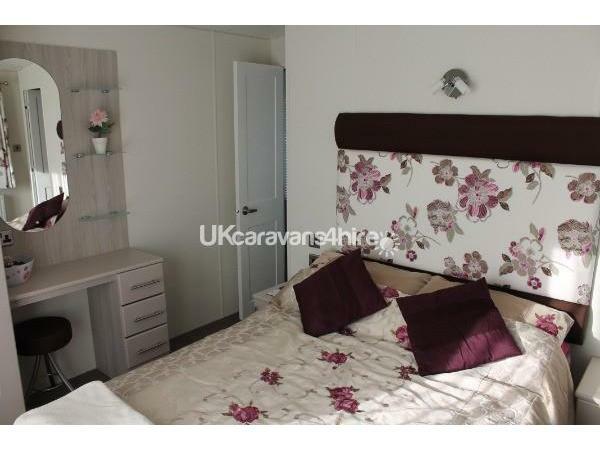 Because our caravan is brand new, and we want it to be looked after properly, we have to charge a damages deposit of £50, on top of the hire charge, which will be refunded within a week of the end of your stay. 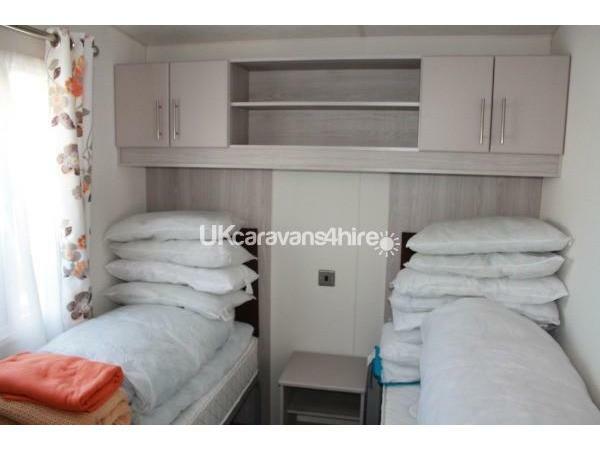 Our caravan is a 2015 model. 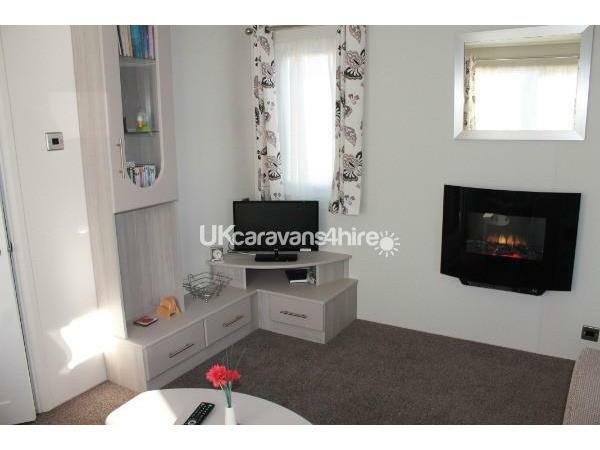 The spacious lounge has a TV with DVD player, and a modern flame-effect electric heater. We have two generously-sized bedrooms, each with its own bathroom. 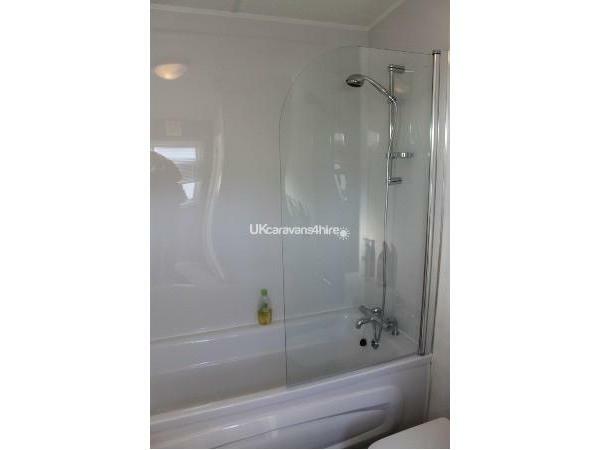 The main bedroom has an en-suite bathroom with a bath and shower over. 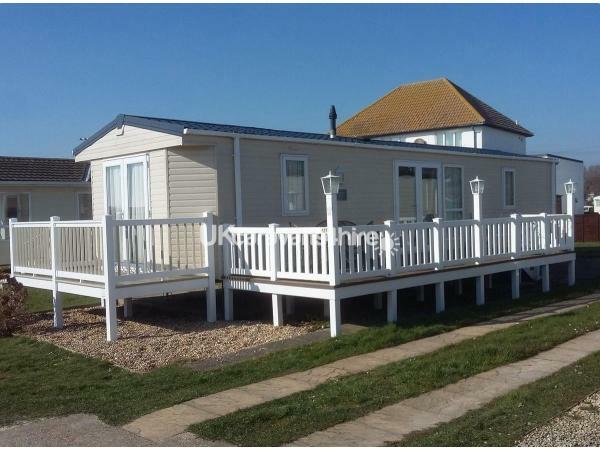 Double doors open onto a small decking with a limited sea view. There is plenty of room between the beds in the twin room. 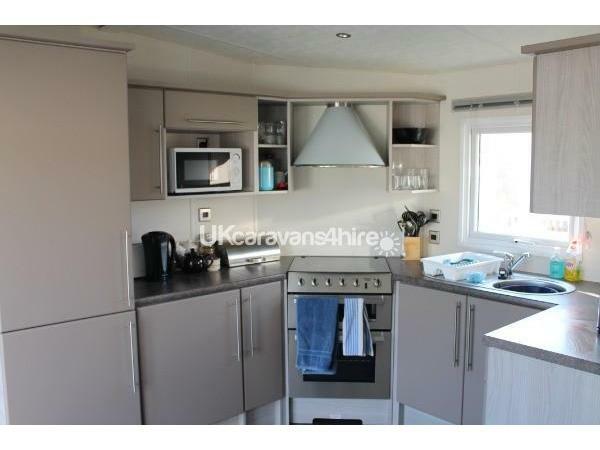 The kitchen is well fitted, with a full sized fridge/freezer. 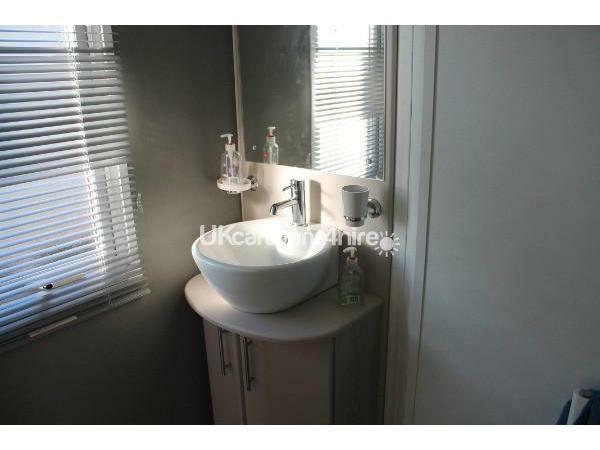 washer/dryer, extractor fan, microwave, gas cooker, toaster, etc. Dining table and chairs are in the kitchen area. 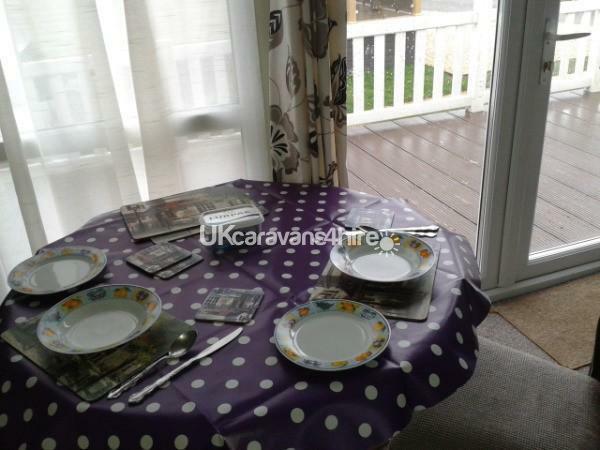 There is a decking to the side of the caravan, with table and chairs. 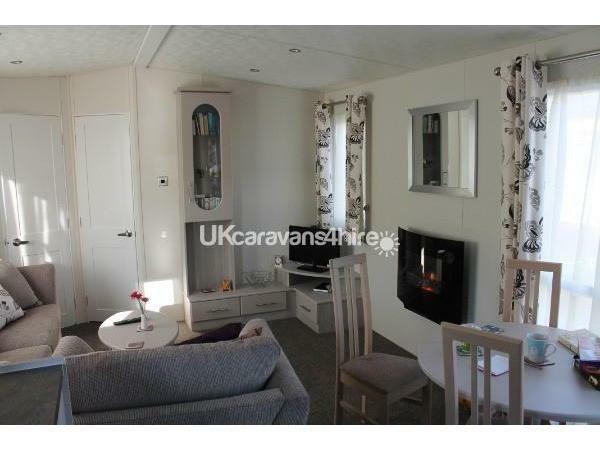 Our caravan has double glazing and central heating. - Toilet rolls, tea, coffee, sugar, biscuits, salt & pepper, soap, tea towels, dishcloths and washing-up liquid provided. - Food Starter Packs are available, please ask. - Beds are made up for you. - Complimentary bottle of wine for bookings of a week or more. Availability changes daily, so please email to enquire. Solent Breezes, near Warsash, boasts spectacular views over the water to the Isle of Wight and is within a 45 minute walk along the coast south to Titchfield Haven Bird Sanctuary or north to the Rising Sun pub on the River Hamble at Warsash. Additional Info: Get passes from reception for the Outdoor Heated Swimming Pool, Childs Paddling Pool, and the clubhouse which has very good food, at a reasonable price. children's play area.